Saints have named eight Academy graduates in their starting line-up for Saturday's Gallagher Premiership game against Wasps at Franklin's Gardens (kick-off 1pm). Alex Moon, Fraser Dingwall and George Furbank will all start a league match for the first time. They are named in the same side as Alex Waller, who is the captain, James Fish, Lewis Ludlam, Teimana Harrison and James Grayson, who also came through the youth ranks. Ben Franks is fit enough to return to add some experience, taking his place at tighthead after being forced to miss last Friday's game at Gloucester with a neck problem. Paul Hill made his long-awaited return from a shoulder injury last Friday, but he is ruled out. Andrew Kellaway starts on the wing, taking the place of Tom Collins, who is out for four to six weeks with a fractured eye socket. Ollie Sleightholme, Will Davis and guest prop Karl Garside could make their first Premiership appearances from the bench. 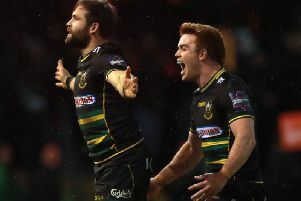 Saints are without Ken Pisi (shoulder), Nafi Tuitavake (neck), Andy Symons (knee), Jamal Ford-Robinson (knee), Harry Mallinder (knee), James Haskell (ankle), Heinrich Brüssow (concussion), James Craig (concussion), Ehren Painter (back), Hill (shoulder), Mike Haywood (knee) and Collins (eye) this weekend. Meanwhile, Kieran Brookes will be making his first return to Franklin's Gardens since leaving during the summer as he starts at tighthead for Wasps. Juan de Jongh and Ashley Johnson, who will be the captain, both return for the away side, who have not won in any competition since the final weekend of September. Saints: Furbank; Kellaway, Dingwall, Francis, Naiyaravoro; Grayson, Reinach; Waller (c), Fish, Franks; Ribbans, Moon; Wood, Ludlam, Harrison. Replacements: Marshall, Davis, Garside, Ratuniyarawa, Gibson, Mitchell, Burrell, Sleightholme. Wasps: Miller; Watson, de Jongh, Lovobalavu, Bassett; Sopoaga, Simpson; B Harris, Cruse, Brookes; Rowlands, Gaskell; Johnson (c), Young, Willis. Replacements: A Harris, West, Cooper-Woolley, Myall, Morris, Hampson, Searle, Le Bourgeois.